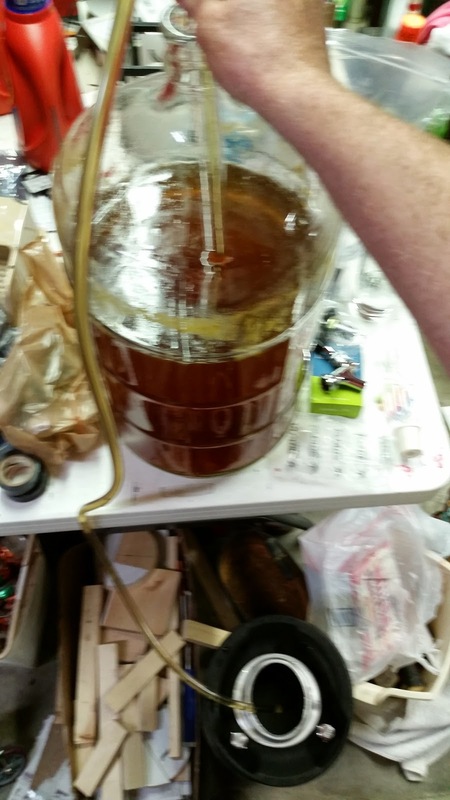 With the semi-recent brewing of our Pliny clone I decided that it was time to take the leap and start kegging instead of bottling. 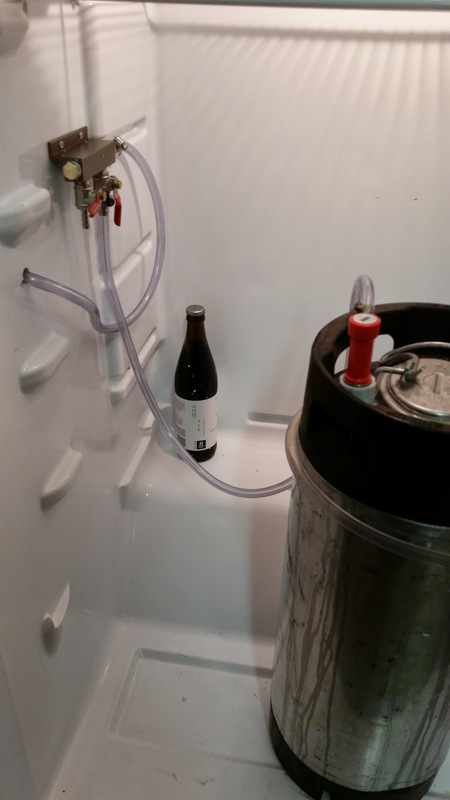 I really don't like bottling at all so it seemed like a no-brainer to jump to kegging. I had the money saved up so now was as good a time as any to make the leap. I started by painting my fridge with chalkboard paint. I actually did this a couple months ago. This was pretty easy to do - I just cleaned the front and sides and then painted. A little goo-be-gone took care of the stickers. I think I probably should have primed the surface as it scratches SUPER easily. I suspect it would have been more durable if I'd have primed. I put on about 4 coats to get a good solid coverage. All of the parts showed up yesterday including my huge 20 pound cylinder (it weighs more than 20lbs empty). 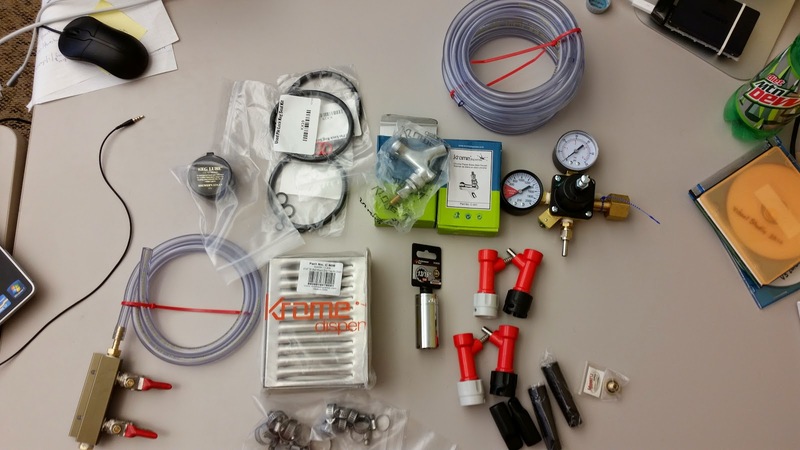 When I left the office yesterday I headed to AirGas to get the cylinder filled/exchanged. They wouldn't do it but fortunately they recommended a place that they thought might and they did. I headed to Tri-State Oxygen and they hooked me up. 20lb canister fill is $20. Not too bad. A friend of mine from Marshall University gave me three free "corny kegs" of the pin lock variety. Pin Lock kegs were used by Coca-Cola. Each keg has a couple little stems on it - one for gas input and the other for fluid output. The two stems have little pins sticking out of the side of them - hence the name pin lock. 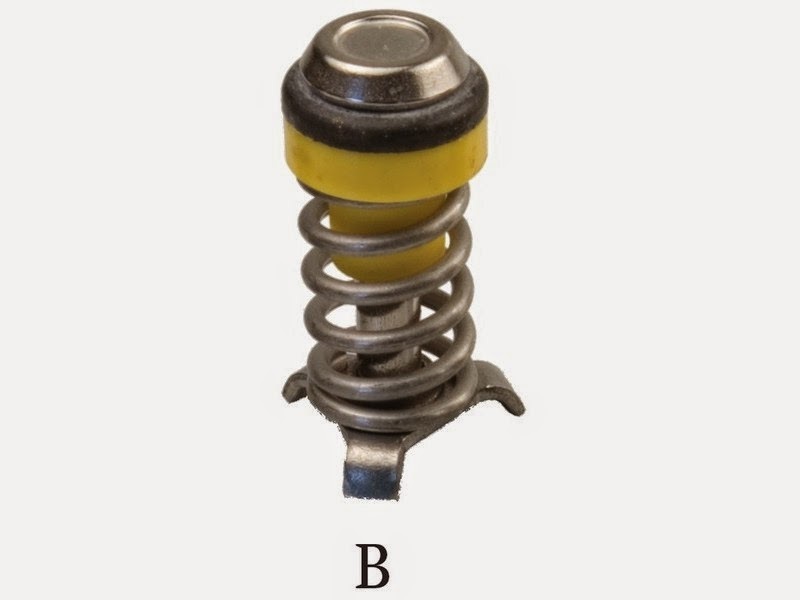 The gas stem has two pins and the beer stem has three pins. It's pretty idiot proof in that regard which is nice. The downside to getting used kegs is they are dirty. The inside of the kegs were acutally remarkably clean but when I unscrewed the stems the inside of each stem and the threads on the keg were caked with old dried up soda. I scrubbed and soaked and scrubbed some more to get the soda residue out. I used oxy-clean and a brass brush which worked pretty well on the threads. Just soaking with oxyclean and using a wash cloth was all I had for cleaning the inside of each stem piece. Inside each stem is a little stick thing with a spring. This is called a poppit. The poppits are kind of wedged in and held in place by their three pronged feet. They can come out. I have no idea how to get them back in properly and in trying to force one of mine back in place I broke one of the poppits. Fortunately, I have three kegs and only one batch of beer. Plus, I only have room in the fridge for two kegs. I'll replace the poppit or maybe the stems in the future so I can use the third keg for filtering (I don't know how to do that yet either). I spent about 3 hours cleaning the three kegs. Maybe longer - I'm not sure. The black rubber handle and base never seem to stop leaving my hands black. I'm not entirely convinced they can be truly cleaned. But the inside and all of the parts/bits that touch my beer are super clean now. I then sanitized them all as well and re-assembled with some new rubber gaskets. Each keg has two tubes in them as well. One is really short, maybe 3-4 inches long and the other is as tall as the keg. I didn't remember which port each tube went with but I deduced that the gas port uses the short tube and the fluid port uses the long. The long tube can be sort of hard to get back in the keg all the way. 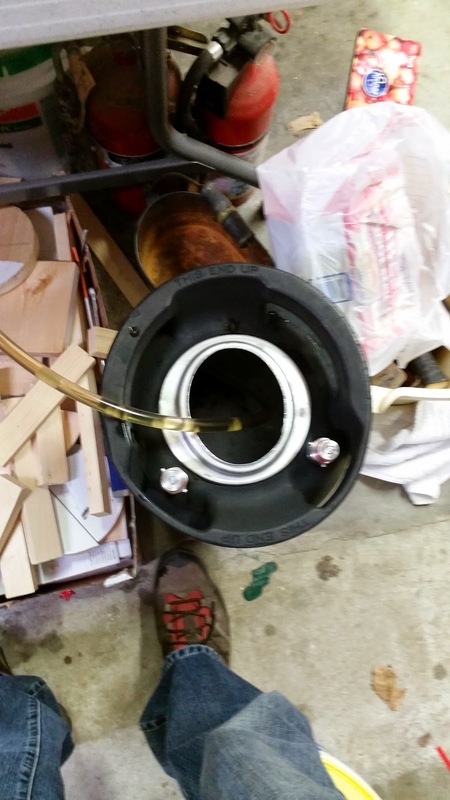 You have to turn it around a bit until it will fully sit into the contour of the bottom of the keg. It turns out the tube is a little longer than the keg is tall. 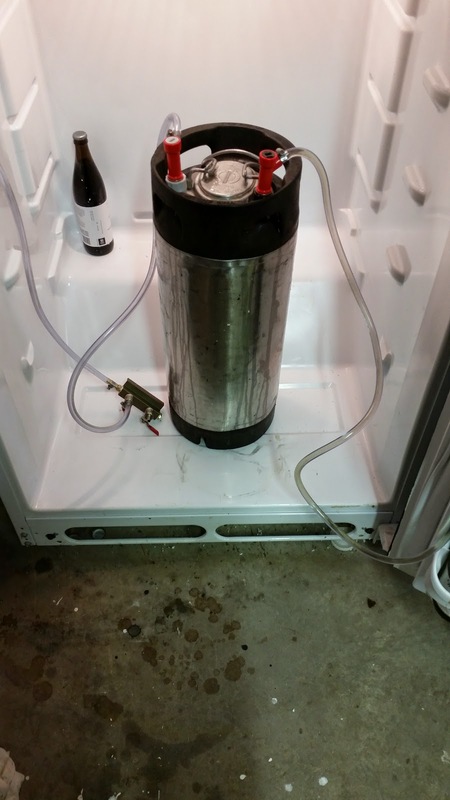 Once I had the keg cleaned and sanitized and put back together I siphoned the beer from my carboy into the keg. This beer went through two dry hop phases so there is a lot of particulate floating around in the beer. I then rubbed a bunch of keg lube on the lid's gasket and closed it up. It turns out this doesn't sufficiently seal the keg. After moving the keg and watching precious IPA seep out around the lids gasket I tried and tried and tried to re-close the lid but nothing I did sealed the keg properly. 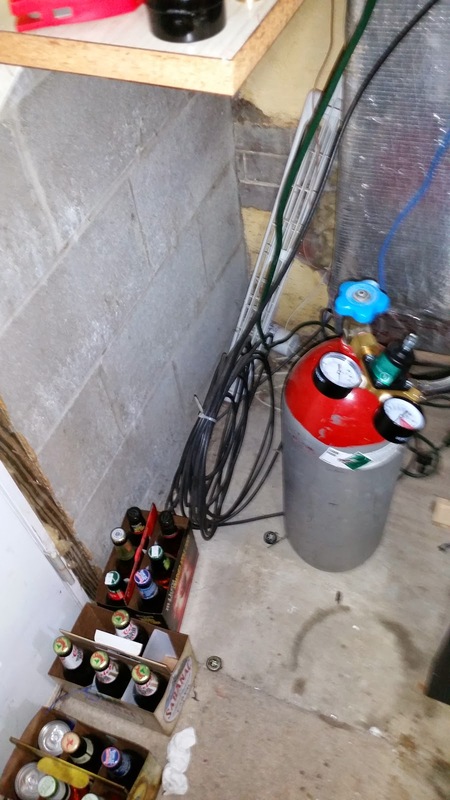 I decided I needed the help of the CO2 so I left the beer alone and went to the construction of the kegerator phase of the project. 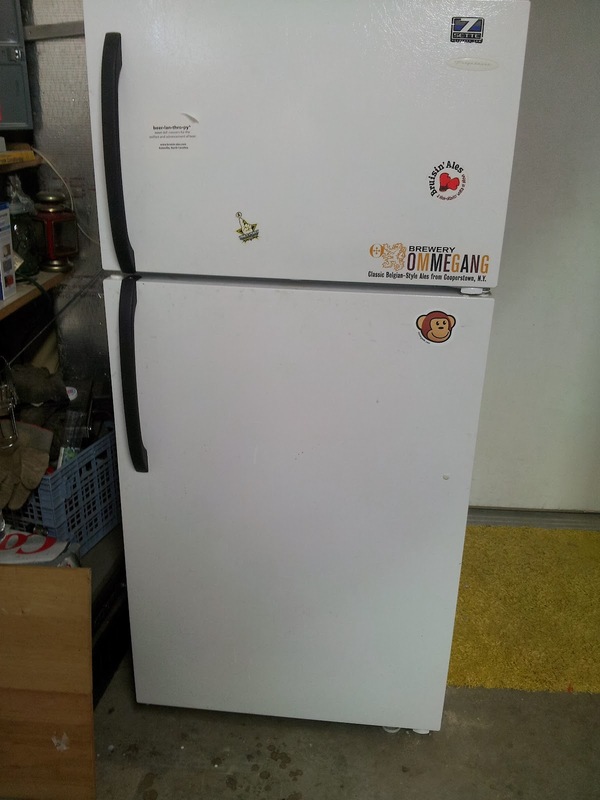 The first step of building the kegerator - to me - was the riskiest, putting a hole in my fridge. I measured and measured again and yet again to make sure I'd be happy with where the faucet handle was on the outside of the fridge and where the beer line would enter the door on the inside. 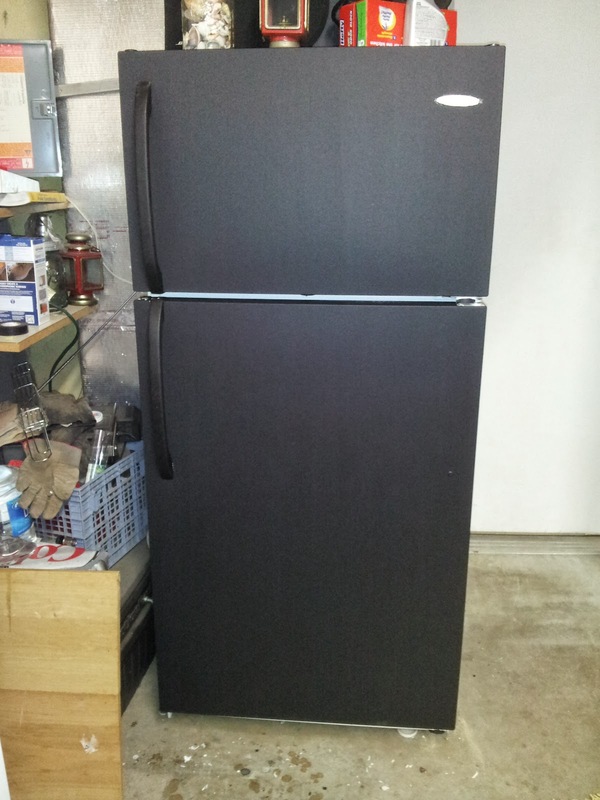 I wanted to keep the door shelves and I wanted the faucet low enough where I could eventually put taller tap handles on without obstructing the freezer door. I'm, at times, an idiot, and this day was one of those times. I forgot the fridge door was metal. I didn't really have a tool to drill a 1" wide hole through a metal door. So I had to stop and drive up to Home Depot and buy a drill bit. I could have actually bought a 1" bit but I knew I'd never use it again so I bought a 1/2" to hedge my bets. I also bought a couple sawzall blades and figured I'd start with the 1/2" hole then use the sawzall to expand it enough to fit the fridge conversion kit through. That plan didn't work out. I managed the 1/2" pilot hole but I just couldn't trust myself with the sawzall so I ended up using the drill bit and I just routed out the full sized hole I needed. I only drilled one of them as I was only setting up one keg today. I probably should have just done both at the same time but I was getting tired, I was hungry, and I was frustrated with myself. So instead I moved on to hooking up the CO2 regulator to the tank. The regulator has a little plastic disc hanging on a plastic chain. This disc is a CO2 leak stopper. The regulator comes with no instructions so the plastic ring really isn't obvious. I also ordered a brass leak stopper from Midwest Supplies. The brass one seemed pretty obvious - it is threaded and screws into the CO2 tank nozzle before you put on the regulator. Except my brass one wouldn't fully screw into the tank - it would only go about half way. I don't know if I was just cross threading it or what but no matter how many times I tried I couldn't get it to go in. I then tried to use the plastic disc (after removing it from the plastic string) but I think the way you make the plastic disc face matters. I'm not really sure but I tried it a few times and no matter what I did when I turned on the CO2 the regulator leaked. When it leaks it leaks loudly and it makes a scary noise. It turns out that after you get the regulator hand tight you need to use a wrench and tighten it about another 1/4 turn. After doing that the regulator didn't leak anymore. I already had a second usage for my new 1/2" drill bit as I had to put a hole in the side of the fridge to feed the gas line through. I drilled that then wrapped the end of my gas line in plastic wrap so no fridge insulation found it's way into the tube and shoved it through the hole. I used some hot water to soften the tubing and then put some clamps on the hose before connecting it to the barb on the regulator. You really do want to use 3/16" inner diameter tubing with 1/4" barbs. If you don't soften the tube first it is really hard to put on the barb - but softening the tube worked perfectly. After getting the hose on the barb I used the screw clamp to secure it and then repeated the process on the two-way gas line splitter I was installing inside the fridge. At this point I had 3 feet of gas tubing going from the tank to the splitter. I then cut a six foot hose in half and connected the splitter to the keg's gas input quick disconnect. At this point I have six feet of CO2 line. I have no idea if this will be a problem or not. If it is I'll post a follow-up and try to update this post with a link to it. At this point I had the CO2 connected to my keg! I figured I'd try to get a better seal on it. I turned on the CO2 and saw that I definitely didn't have a good seal on the door and I learned that I needed to connect the fluid line too because even though the fluid poppit wasn't depressed beer still sprayed out of the fluid stem. I put the fluid quick disconnect on and it came out of that too. I ran a six foot tube from the fluid disconnect to the tap and fastened them with the screw clamps as well. Then I tried again. The lid was still leaking but nothing else was spraying beer. I was so close. I tried to open and close the lid again - still leaked. I tried again - still leaked. I smeared keg lube all over the area where the lid and the keg met - still leaked. I grabbed the other two lids, sanitized them, smeared them with keg lube and tried again and again and again and again and it still leaked. I reverted back to my original lid and tried to just hold the lid firmly closed without trying to lock it and I wiggled it around a little and then, suddenly, it shifted just a touch on it's own and sealed. No leak. I was able to lock the lid closed without it moving at all. It was a beer day miracle. The damn keg was sealed, the CO2 was going in, it was connected to the fridge faucet.. time to test the faucet to make sure there are no leaks. I ran into the house, grabbed a pint glass, returned to the fridge and pulled the handle. Beer was in the glass and nowhere else! From there on it was just a matter of clean up and of putting a couple screws into the splitter to hang it. When all was said and done it took me about 7.5 hours from the time I left to find a place to fill/exchange my C02 tank to being completely done (including cleaning the carboy). But writing on the fridge at the end made it all worth while. I still have to add the second tap and the drip tray. I didn't have the right screws to hang the tray and it didn't come with any. 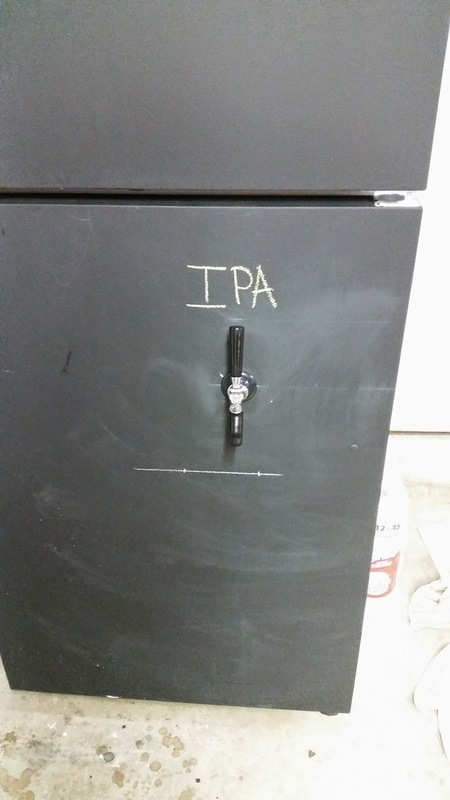 NOTE - nothing comes with instructions when you buy it so if you decide to build a kegerator just take your time and it will work out. If I could do it then, seriously, anyone can.